Are you an experienced business person or entrepreneur and want to learn about how you can invest in early stage technology companies with real global potential? What is HBAN and how can we help? How much time can you commit to the process? Can you act as a mentor? Are your business experiences & skill set something that can benefit the type of companies you wish to get involved in? Can you accept new roles (e.g. Company Director) and incorporate them into your business life? Can you resist the temptation to micro-manage your portfolio of investments? How much are you willing to learn in order to become a capable Angel if you have little experience? If you are positively disposed to these questions, then HBAN is interested in hearing from you. By registering with HBAN we can give you online access to investment opportunities that fit your investment criteria. HBAN uses the GUST platform to share and access deal flow online from where you can access new deal flow as it emerges, and view the relevant documentation on each investment opportunity. HBAN has lots of resources to help its members source, build and manage their portfolios. As a member you will be invited to masterclasses, educational webinars and you will receive a quaterly educational newsletter with investment advice from the experts. 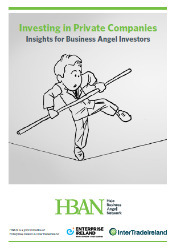 HBAN has also published a guide to explain fully the process of business angel investing “Investing in Private Companies Insights for Business Angel Investors”, click on the link for the full pdf version of this free guide. Business angel investors are high net worth individuals who provide smaller amounts of finance (typically in the range €50,000/£40,000 to €250,000/£200,000) at an earlier stage than many venture capital funds are able to invest.They are increasingly investing alongside both seed venture capital funds and government agency funding on the island. Angels usually contribute much more than pure cash – they often have industry knowledge and contacts that they pass on to entrepreneurs. Angels will often take non-executive board positions in the companies in which they invest. The importance of business angels to the equity capital industry has grown significantly in recent years. In the United States business angels invest a similar quantum of money as the US venture capital (‘VC’) community (seed and growth capital) on an annual basis. They invest in many more companies than VC's since the average business angel investment is much lower than the average VC investment. 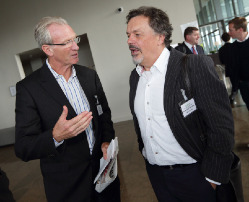 The growing role of business angels as catalysts in many start-up companies is now well recognised in Europe including the island of Ireland. It is worth noting that much of the business angel community is ’ad-hoc‘ involving family, friends and private individuals investing directly in start-ups but not as part of any formal network. Investing in private companies is very high risk. Recent studies in both the United States and the United Kingdom have indicated that angel investing can generate significant returns through portfolio investing (i.e. investing in more than one company). A study conducted for ACA showed that overall returns in the US for angel investment were 2.6x in 3.5 years. 3. Active involvement in the company once the investment has been made. 44 % of investments that generate positive exits win at a larger multiple than the costs of the negative exits, the overall return to business angel investing in the UK is 2.2 times the invested capital. 9% generate a return of more than 10x. Given the holding period of just under four years, this is approximately a 22 percent gross Internal Rate of Return (IRR). Both studies also showed that investing in follow on rounds often had lower returns. This could be related to the difficulty investors have in determining when to exit investments, particularly ones that do not appear to be successful. It can be more of a challenge to admit to other syndicate members that an investment has failed and should be written off. The most likely outcome of any one angel investment is failure. However studies show, overall, business angel returns are enhanced by using a portfolio approach to investing. Angels do not necessarily measure success purely by return on investment. An individual investor determines success according to personal interests and needs. 3. Interest in a business model or sector, etc. Angels with entrepreneurial expertise outperformed those without it, especially in earlier-stage opportunities. More than half of the investments were very early-stage, going into pre-revenue ventures. Those who invested in opportunities where they have specific industry expertise failed significantly less. Those who perform at least some due diligence, even just 20 hours, experienced fewer failed investments. After the investment is made, some involvement with the venture was related to improved investment outcomes. However, failure was greater where investors were perhaps too involved, specifically when they held management roles. Exits where the business angel investor had made follow-on investment in the venture were significantly less successful. • Syndicates need to be well managed to take advantage of the benefits and mitigate the pitfalls; the best syndicates use a charter. Investing in private companies, whilst high risk, can be rewarding and worthwhile with positive financial and non-financial outcomes. If it accelerates the growth of company then entrepreneurs will reap similar rewards. This is a win-win.